Making comics is difficult work. It’s not manual labor (well, I guess it kind of is)––but, for people like me, I am often psychologically drained when working through scenes. One of the best ways to counter-act this is to talk to people––almost anybody––about the process and the minutiae of what is being worked on. Of course, a great way to counter-act this is to share “war stories” (so to speak) as well as talk shop with other comickers. I recently recorded one of those talks (at the bottom of this post) with friend and fresh-on-the-comicking scene, Jason Tudor. Jason Tudor is a friend that goes back to my Eben07 days––he was an early fan and supporter of the comic and we kind of hit it off as the years went on. I came to know him best from the excellent pop-culture podcast of which he is the MC––moderating discussions with fellow co-hosts, Keith Houin and Michael Wistock––called The Science Fiction Show, and which he still spearheads despite difficulties in getting schedules to sync up between the hosts (it is literally an international and bicoastal show with the hosts spread across continents). More recently, Jason has teamed with his Science Fiction Show co-host, Keith Houin, to create his own webcomic a lifetime in the making. Vorpal is the culmination of a life-long dream and his desire to challenge himself. Vorpal is a science fiction/space opera/espionage-action comic about the eponymous assassin. Jason is jumping into this endeavor feet first, into the deep end. Neither he nor Keith have created comics before, and Jason is making the daring move (dare I say similar to how I entered into the game back in 2007) of learning in front of an audience. Anyway, I felt it would be a boon to webcomicking archival efforts to snag a talk with Jason and try to cover as many different angles in an effort to take a snapshot of a creator at the start of his story. Jason’s a great speaker and it was a really fun to participate in as well as listen to (I created no fewer than three edits of this, so I’ve heard it a lot and still enjoy it). There are still a lot of topics we didn’t cover, so expect more from Jason in the future. With Vorpal, I’m really looking forward to watching Jason’s talents––and the comic itself––grow over time. NOTE: This is the full talk that was abbreviated for time on my podcast, For All Intents and Purposes, which I co-host with Andrew Asplund (the episode in which the truncated interview appears is here). This cut is much longer with a lot more content, topics, and blemishes of editing. Hello from the hollows of the internet! Worry not as new pages are being worked on, and will be posted as soon as they are ready. Final Cover for Long John Book 1. I’ve also been long wanting to create an ostensible internet hub for all the things I do and, while not a replacement for any of these things, it can be a place that I can send people to and they can go to Long John, or A Podcast [ , ] For All Intents and Purposes, and whatever else from there. I’ve had my eye on Tumblr for awhile, but never really jumped onto it because I hadn’t really an idea as to what it was or did. To my best estimation, it’s an interesting idealogical meeting ground between Facebook and Twitter. Less complicated than Facebook but more robust than Twitter. Less insipid than Facebook can be, but as interactive and fast-response as Twitter can be. And you can write more than 140 characters, which is nice. 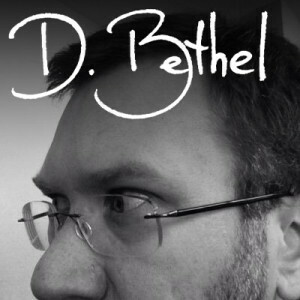 So, I jumped on board and have pointed a domain I haven’t been using to it: dbethel.net. I just opened it up and it’s a little sparse, but I do enjoy it (well, mostly, its potential) quite a bit. As I think of ways to expand its use, it will fill out over time. I chose Tumblr over building a new website mostly because I don’t want my hub to be a deep time-sink for potential users with loads of pages to plow through or even a deep archive. I’m not sure if I’ll be re-posting my longer blogs there (likely, I’ll just be posting the links to the Tumblr from here), but it will depend on the quality of its blogging capabilities. Also, building a website––with my limited ability and knowledge––is an endeavor which exhausts me just from the thought of it, even with the relative ease of something like WordPress (which Long John is built upon). I wanted dbethel.net to be sleek and superficial––kind of like a catch-all business card that says, “This is who I am, and this is what I do.” I have high hopes for it, but not on a grand scale, but mostly as a centralized location where I can share and post about all my interests without worrying about crossing audiences or mixing messages.